On Saturday, women and their allies will take to the streets in cities around the world for the third annual Women’s March. But this year, the leaders of Women’s March Inc. — one of the organizations that grew out of the original march, and the most visible public face of the march today — are facing calls to step down. The reasons include criticisms of their association with Nation of Islam leader Louis Farrakhan and allegations that they made anti-Semitic remarks in planning meetings. Women’s March Inc. is a national organization led by four activists from New York City — Tamika Mallory, Linda Sarsour, Carmen Perez, and Bob Bland — who helped organize the first march in Washington, DC, in 2017. The group also has local chapters that are planning marches in cities around the country this year, though other local marches are not affiliated with Women’s March Inc. The controversy has contributed to the cancellation of at least one city march, and a number of progressive groups, including the Southern Poverty Law Center, have dropped their partnerships with the Women’s March, according to the Jewish News Syndicate. Meanwhile, the Democratic National Committee appears to have been removed from a list of partners on the Women’s March website. “I don’t agree with these statements,” Mallory reiterated. She also resisted calls to step down. “I am willing to lead until my term at Women’s March is up,” she said. No matter what happens at those marches, the influence of the Women’s March on American feminism — and on the left more broadly — is undeniable. And a groundswell of women’s activism in the wake of the 2016 election has led to an unprecedented number of women in the halls of political power; earlier this month, a record 117 women were sworn into Congress. The future of Women’s March Inc., and of women’s marches around the country, may be in doubt. But the impact of the Women’s March as a broader movement on American politics endures. 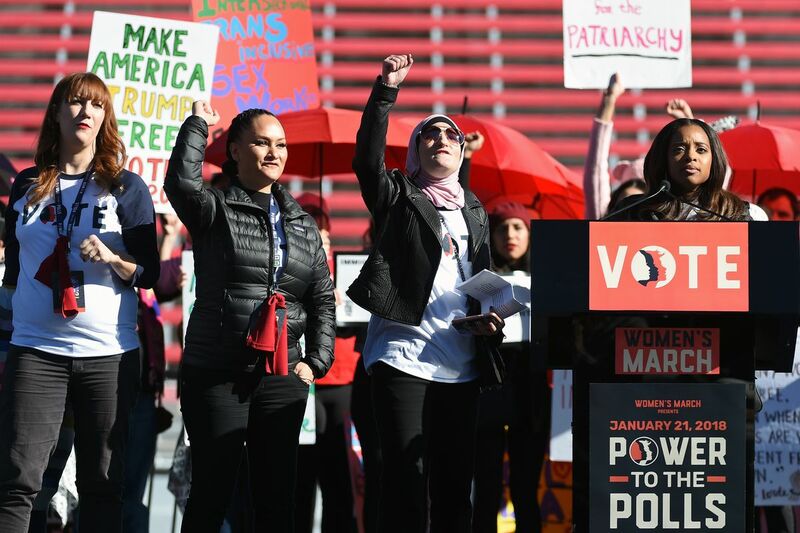 Women’s March Inc. is no stranger to controversy, having weathered debates over representation of women of color and the inclusion (or exclusion) of a variety of groups from its official platform. But criticism of the group intensified in March 2018 when Mallory attended a Nation of Islam event at which Farrakhan made anti-Semitic remarks. In November, as controversy grew over the issue, Teresa Shook, whose 2016 Facebook post kicked off the first march, called on Mallory and the other co-chairs of Women’s March Inc. to step down. Then in December, Leah McSweeney and Jacob Siegel at Tablet reported that, according to others involved in planning the march, Mallory and fellow Women’s March Inc. co-chair Carmen Perez had made anti-Semitic comments themselves. At a meeting to plan the first Women’s March, Mallory and Perez “asserted that Jewish people bore a special collective responsibility as exploiters of black and brown people,” sources told Tablet. Mallory and the Women’s March have denied these allegations. But the Tablet report, as well as Mallory’s association with Farrakhan, has led some groups to drop their affiliation with Women’s March Inc. In December, the Washington state chapter of the Women’s March announced that it would disband and affiliate with a different progressive group, Smart Politics. Organizers in Spokane, Washington, still plan to hold a march. Meanwhile, earlier this month, organizers of the New Orleans Women’s March announced they were canceling this Saturday’s event. A number of progressive organizations, from the SPLC to Moms Demand Action for Gun Sense, have dropped their affiliations with Women’s March Inc. over concerns about anti-Semitism, according to the Jewish News Syndicate. “Moms Demand Action isn’t an official sponsor of the Women’s March, but plenty of chapters have chosen to participate in the locally organized events,” Taylor Maxwell, a spokesperson for Moms Demand Action, told Vox. The SPLC has not responded to Vox’s request for comment. The DNC, once listed as a march sponsor on the Women’s March Inc. website, no longer appears there, according to CNN. Asked if the relationship between the DNC and the Women’s March had changed from last year to this year, a DNC official declined to comment further. Final season premieres are surprisingly important. You’re the Worst has a great one.